10 Facts About a Fun Team is a new feature in which we’ll take a look back at a notable team and season from NHL history. That team may have been good. It may been bad. But it was definitely interesting, and as such it deserves to be remembered. So yeah, the Buffalo Sabres are pretty bad. That’s largely by design, and it’s all in the service of a larger goal, so someday their fans might look back on the 2014-15 season and smile. But right now, it can’t be very fun. Let’s try to cheer up those fans with memories of a better time. Not an especially good time, mind you, because these are still the Sabres and franchise history is relatively thin on those. But a better time, featuring a team that may not have been all that great, but was at least interesting. 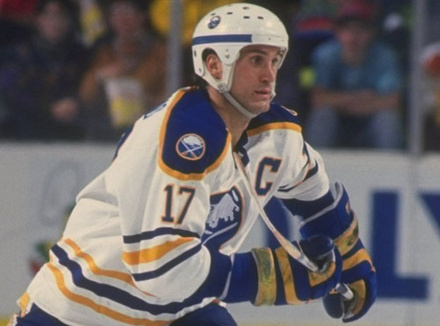 Let’s use this edition of 10 Facts About a Fun Team to travel back 26 seasons and relive the magical weirdness of the 1988-89 Buffalo Sabres. 1. The 1988-89 Sabres were … OK. Under normal circumstances, that sort of record would render the ’88-89 Sabres largely forgettable, just one of the many mediocre teams in any given season that nobody ever thinks about again. And indeed, the Sabres have been largely forgotten. But they shouldn’t be, because once you get past the record, this was one odd team. We’ll get to all of that in a second. But first, let’s set the mood by enjoying this long-distance Handycam footage of the Sabres beating Mario Lemieux and the Penguins. 2. The roster didn’t feature a single future Hall of Famer. That may not sound all that surprising, considering we’re dealing with a mediocre team. But back then, it was actually fairly unusual to ice a roster without even one future Hall of Famer. For example, the worst team in the league in 1988-89, the Quebec Nordiques, had three Hall of Famers, and would go on to draft another and sign one more the following offseason.2 Even other awful teams, like the 61-point Islanders and the 62-point Maple Leafs, had one. But not the Sabres. They were a decent enough team, but despite that, not one of the 42 players who suited up for them that season would go on to earn hockey’s highest honor. That’s not to say that nobody came close, though, which is where things get fun. The ’88-89 Sabres may be the greatest team hockey has ever seen when it comes to assembling a collection of near-miss Hall of Famers. 3. The roster featured a ridiculous number of almost Hall of Famers. The Sabres’ leading scorer that year was a 19-year-old center named Pierre Turgeon, who racked up 88 points. Their top-scoring defenseman was Phil Housley, who had 70 points and made the All-Star team. And their most productive winger was Dave Andreychuk, who scored 28 goals despite playing in just 56 games. A quarter century later, those three names appear at the top of another list. Here are the NHL’s all-time career leaders in points scored; note that Hall of Famers are marked with an asterisk. If we assume, as just about everyone does, that Mark Recchi will be inducted soon and that Jaromir Jagr and Teemu Selanne will be first-ballot slam dunks once they’re eligible, that leaves three names at the top of the list for most career points by a player who didn’t make the Hall of Fame: Turgeon, Housley, and Andreychuk. All three have been eligible for years and never seem to get much traction with voters, so while it’s still possible that one or more could someday get the call, it seems exceedingly unlikely. Ironically, within a few years, each one of those three players would go on to be the centerpiece in a trade that did bring a future Hall of Famer to Buffalo: Turgeon for Pat LaFontaine, Housley for Dale Hawerchuk, and Andreychuk for Grant Fuhr. By the way, Turgeon, Housley, and Andreychuk weren’t the only Sabres to put up borderline hall-worthy numbers. Goalie Tom Barrasso went on to record 369 career wins, which currently ranks sixth among eligible goalies who aren’t in the Hall of Fame. And unlike Barrasso, none of the guys ahead of him can boast both a Vezina and a Stanley Cup ring. 4. Their enforcer went on to an interesting post-playing career. This would become pretty standard stuff for the Sabres — we were just a few years away from the era when Rob Ray, Brad May, Gord Donnelly, and friends would make Buffalo the go-to choice if you wanted to goon it up in NHLPA ’93. What made Maguire unusual was his next job: He became a referee. Maguire’s officiating career, which also included time as a lineman, began in the minors and eventually saw him work games in the NHL, leading to every hockey fan experiencing the same “ha, that ref has the same name as that crazy enforcer guy from a few years ago and … wait, it couldn’t be …” moment. There’s no word on whether he ever told the players not to do stuff like this. 5. One of their veteran players was also their future coach. The longest-serving Sabre on the ’88-89 team was defenseman Lindy Ruff. He was in his 10th year in Buffalo, although he wouldn’t make it to the end of the year. In March, the Sabres dealt him to the Rangers, where he played out the rest of his career before retiring in 1991. Ruff quickly joined the coaching ranks, getting a job as an assistant with the Florida Panthers as a 33-year-old in 1993. He held that job until the 1997 offseason, when he was named head coach of the Sabres. He’d hold that job until he was fired in 2013; at the time, he trailed only Al Arbour for most games coached with a single team. He’s now the coach of the Dallas Stars. 6. They had a bunch of other guys that you probably don’t remember as Sabres. For instance, they featured a sophomore defenseman who’d been the team’s first-round pick a few years earlier, but they traded him to Washington late in the season. That would be Calle Johansson, who’d go on to become the Capitals all-time leader in career games played. Speaking of 50-goal scorers, the Sabres also had Rick Vaive, who arrived the day after Christmas via a trade with the Blackhawks. He’d go on to play parts of four seasons with the Sabres, but remains best remembered for this earlier stint in Toronto, when he scored 50 goals in three straight years. In fact, in the history of the Toronto Maple Leafs, the franchise has seen only six 50-plus-goal seasons; between Vaive and Andreychuk, five of those seasons came from members of the ’88-89 Sabres. 7. They managed to lose a game 9-0 … twice. But to their credit, when the Sabres did decide to get skunked, they went all out. The sports world usually reserves 9-0 losses for baseball teams who declared a forfeit, but the ’88-89 Sabres managed to lose by that final score twice over a stretch of 13 games. The first of those came on November 5, 1988, at the hands of the Calgary Flames, who were powered by Doug Gilmour’s five assists and Joe Mullen’s hat trick. No real shame in that; the Flames were stacked, and would go on to win the Stanley Cup that season. The Hartford Whalers weren’t quite so stacked, and would go on to finish fourth in the Adams. But they too managed to pump the Sabres by a 9-0 final, on December 6, 1988. They were led by three-point nights from Ron Francis, Kevin Dineen, and Sylvain Turgeon — the latter of whom was probably best known as Pierre’s older brother. You might look at a team that lost multiple 9-0 games and assume that its goalie wasn’t very good. But when it came to the ’88-89 Sabres, that led to the question: Which goalie are we talking about? 8. They went through way too many goalies. The Sabres opened the season with Barrasso entrenched as the starter; he’d finished as the runner-up in Vezina voting the year before. But he was awful over the season’s first month, and the team traded him to the Penguins in mid-November. That left the starter’s job to youngster Daren Puppa and veteran Jacques Cloutier, who ended up splitting time. But Puppa broke his arm in January, and Cloutier struggled. The team plugged the gap with youngster Darcy Wakaluk and journeyman Darren Eliot, before trading for veteran Clint Malarchuk in March. If you just lost count, that’s six different goalies used in a single season, which is almost unheard of. According to my in-depth research,6 only about a dozen other teams in league history have used at least six goalies in a season. Most of those, such as last year’s Oilers, were train wrecks. For the Sabres to remain quasi-competitive in spite of a revolving door in the crease was actually sort of impressive. Of course, you can’t discuss the ’88-89 Sabres’ goaltending woes without mentioning one specific incident. Fair warning: Those with weak stomachs will want to skip this next section. 9. They witnessed the most gruesome injury in hockey history. On March 22, 1989, Malarchuk was in goal for a home game against the visiting Blues when St. Louis forward Steve Tuttle crashed into the crease after becoming tangled up with Sabres’ defenseman Uwe Krupp. It wasn’t an especially dangerous-looking play, but it immediately became clear that something had gone horribly wrong. Malarchuk came up clutching his throat and bleeding heavily — Tuttle’s skate had sliced his throat. It was a horrific scene, and only the quick work of the Sabres’ trainers and team doctors prevented Malarchuk from dying on the ice. He lost a significant amount of blood and required 300 stitches to close the wound. Amazingly, Malarchuk returned to practice days later, and played in the team’s final regular-season game on April 2. But as captured in this 30 for 30 Short, his emotional recovery took significantly longer. 10. They lost in the first round, because of course they did. After all of that, it would be nice to finish off with the tale of how the ’88-89 Sabres embraced their underdog status and came together in time for a deep playoff run. That would be a fitting end to our story, and would give Sabres fans something to smile about for a change. But that ending doesn’t exist, because it was the ’80s and these were the Sabres. We already mentioned the way the late-’80s/early-’90s Sabres basically mastered the art of finishing third in the Adams. There was a second half to that equation: They always went out in the first round, too. From 1983 through 1992, the Sabres made the playoffs seven times and lost in the first round each time, with two losses to the Nordiques, two to the Canadiens, and three to the Bruins. It was Boston who got to do the honors in 1988-89. The Sabres looked good early, pumping the Bruins 6-0 in game one at the old Boston Garden, with Cloutier earning the shutout. That would end up being their last win of the season, as the Bruins took four straight to eliminate the Sabres in five. In the offseason, the Sabres kept their roster largely intact, but fired their coaching staff, bringing in rookie head coach Rick Dudley (aided by a mustachioed young assistant named John Tortorella). It didn’t make much difference; they lost in the first round, again. They’d eventually turn over most of the roster, tearing down the remnants of the 1988-89 team in an attempt to rebuild into a contender, or at least a team that could finally get out of the first round. That wouldn’t happen until 1993, when the Sabres finally ended their decadelong futility streak by upsetting the Bruins. For no other reason than that Sabres fans deserve a little happiness these days, let’s close out with the clip of how that series ended. From 1987 to 1992, the Sabres finished third four years out of five. The other year, they were second. Peter Stastny, Michel Goulet, Joe Sakic, Mats Sundin, and Guy Lafleur. He also once got smoked in a fight by Wendel Clark, which wouldn’t be all that unusual except that they were teammates at the time. That record would later be shattered by Jonathan Cheechoo. For comparison, the 2014-15 Sabres were shut out four times in their first 10 games alone, and have been eight times (and counting) on the season. I.e., this four-year-old Yahoo Answers page I found.